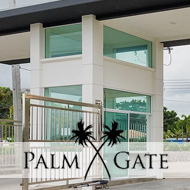 A large, newly opened factory in Pattaya contacted the team at Thai Garden Design to help them create and install a complete sprinkler system to cover all areas around the perimeter of the factory. The owners had been careful when designing the building to include lots of space for grass, plants and trees, which they believe will make the factory a more pleasant place to work and visit. A water source was available at the back of the landscape which the team tapped into for the system. After advising on, and installing the correct sized pump, both sides of the factory were covered with two types of pop up heads, and drip irrigation tubes which water the grass at the furthest edges of the gardens. The factory landscape consisted of several lawns, of differing sizes, and a large lawn at the front of the property along the roadside, all of which were covered by the configuration. The team also ensured that in the design there was no need to cut out parts of the road, to run the sprinkler pipes, which saved the customer time and money. If you own a factory or workplace that is currently manually sprinkled by workers, and it takes up a large portion of their day, why not consider installing a sprinkler system? It can be fully automated, tapped into an existing water supply, and with no need for manual watering. If you're interested, contact [email protected].